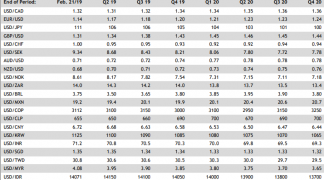 - GBP cedes the best performer crown of 2019 to CAD. - Market hopes of a Brexit delay wither and "no deal" risk ticks higher. - Analysts mixed over GBP outlook as palpable as national Brexit divide. The Pound ceded its position as the best performing G10 currency for 2019 on Wednesday after a key vote in House of Commons dented market hopes of a delay to the UK's departure from the European Union, and analyst opinions vary on the question of where the British currency is likely to head next. MPs in the House of Commons voted to reject the so-called Cooper-Boles amendment to the EU Withdrawal Bill by a majority of 16 on Tuesday, scuppering an effort by pro-European Union lawmakers to wrestle control of the Brexit process from the government. The Cooper-Boles amendment would have enabled MPs to force the government into requesting an extension of the Article 50 Brexit countdown if the Withdrawal Bill does not make it through the gauntlet that is the UK parliament before the end of February. 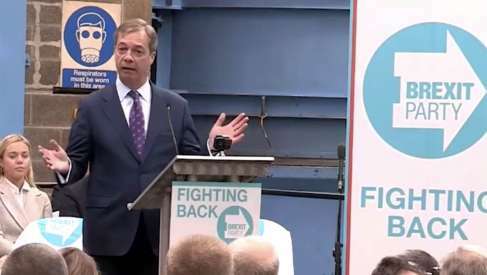 Markets had seen that as safeguard that would at the very least, prevent a so-called no deal Brexit that sees the UK default to doing business with the EU on World Trade Organization terms, and to potentially undermine the nation's exit from the EU altogether. That is why Sterling became the best performing G10 currency this January, second only to the Canadian Dollar, with gains over the Dollar and Euro both topping 3% ahead of Tuesday's vote in parliament. But rather than back the Cooper-Boles amendment, lawmakers voted instead to support another motion that said parliament will ratify Prime Minister Theresa May's Withdrawal Agreement if the highly contentious Northern Irish backstop is made time-limited or removed from the agreement entirely. The decision by parliament has now seen the perceived risk of a WTO Brexit rise and Pound Sterling cede its G10 best performer crown to a resurgent Canadian Dollar, which is benefitting from a nascent recovery of oil prices. Conservative Party MPs from both sides of the Brexit divide now appear to be rallying around an alternative Brexit plan called the "Matlhouse compromise", which has been hailed as a possible solution to the gridlock in parliament. The problem with this for the British currency is the alternative plan does little to prevent the risk of a 'no deal' Brexit and it makes no provision for either a rerun of the referendum or for another election to take place. Sterling was quoted -0.01% lower at 1.3077 during the noon session Wednesday after having fallen from 1.3150 during the overnight session. It's now up 2.6% for 2019. The Pound-to-Euro rate was 0.03% higher at 1.1439 although that pair also fell substantially during the overnight session, leaving it up by just 2.9% thus far in January. Below is a selection of analyst comments and views on what Tuesday's parliamentary defeat might mean for Brexit and Pound Sterling over the coming weeks and months. "The outcome revealed major opposition towards leaving with No Deal (without concrete plans to avoid crashing out) but a majority in seeking changes to the Irish backstop. Though the Conservative party looks more united, the EU was quick to note that no further changes to the Withdrawal Agreement (WA) can be made. No. 10 will have to hope that tone changes." "The ball is now in her court as she now returns to Brussel to seek changes on the WA, with a "Meaningful Vote" slated for February 13. At this point, an extension of Article 50 is almost certainly inevitable. This leaves GBP effectively untradeable still, but we are at least encouraged by cable respecting the 200-day near 1.3050. Going forward, we expect this pair to be more of a chop-fest than anything else. We remain cautious on the currency for the foreseeable future." "After the House of Commons passed the Brady amendment, Theresa May will now travel to Brussels to try and renegotiate the backstop. The problem is that the EU is not willing to renegotiate, while May still don’t know what to ask for. Sell GBP. Theresa May will travel to Brussel to ask for a unicorn and will return empty-handed." "It is hence still very hard to see any sort of breakthrough appearing in the Brexit talks soon, yet still markets seem to position for a probability-weighted much more benign Brexit outcome than just months (or even weeks) ago. EUR/GBP had moved from above 0.90 to levels below 0.87, before the rebound post the amendment voting yesterday. All in anticipation of a more benign Brexit." "We find it hard to justify the current Brexit optimism and would put a larger subjective probability on the no-deal risk than markets do. Therefore, we suggest being long EUR/GBP accordingly, targeting levels of at least 0.8950." "The result is that PM May heads off to Brussels seeking to persuade her EU counterparts to do something they have said they simply can't do. That leaves the danger of a deal-less departure still alive, even if it is unlikely. A reversal of the referendum is also very unlikely, but still possible.Most likely, is that a deal will be reached but only after talks go into extra time and a delay is agreed." "EUR/GBP fell 5% in 3 week this month, creating 15-month highs and lows in the prices. It'll probably settle into a 0.865--0.8850 range for a while now, with a break back over 0.90 only really on the cards either if EUR/USD breaks higher (unlikely) or a no-deal Brexit becomes more likely. 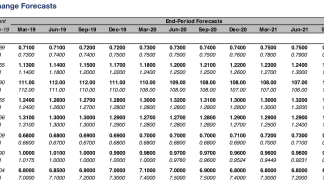 GBP/USD longs will appeal (a lot) to anyone who thinks a no-deal exit is inconceivable and think the euro is a long-term buy." "The declines in the GBP yesterday herald the beginning of a new Brexit phase. Instead of the dynamic being dominated by a war between the conflicting views of UK parliamentarians, the outcomes of yesterday’s votes now pit MPs against Brussels over the terms of the Withdrawal Agreement." "For now, it is sufficient to say that the upcoming battle will probably keep the threat of a “no deal Brexit” hanging in the balance right up until the 11th hour. GBP gains should therefore be limited." "GBP has sold off on the failure of the Cooper amendment (to take negotiations out of the govt’s hand were there No Deal by Feb 26th) and as James Knightley writes, there will be much volatility over the next two weeks since it looks as though parliament will be voting again on Feb 13/14th. 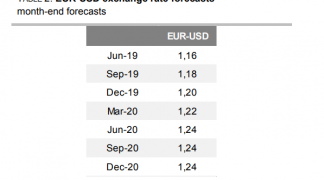 This isn’t a knock-out blow for GBP– a path for an orderly Brexit is still possible – but disappointment over a more clouded path to a second referendum could see Cable dip back to the 1.2920 area. More volatility is assured." "GBP’s drop last night reflects disappointment that the Cooper bill failed. That said, GBP/USD is still up around 2.8% year to date. On balance, the market appears to still be judging that policymakers will be able to avoid a hard Brexit before the March 29 deadline." "There are some whispers that the PM may be able to secure some changes to the Political Declaration about the UK’s future relationship with the EU. However, this is a non-binding agreement and changes to it may not be sufficient to appease MPs." "There is also speculation that the EU could demand some change in PM May’s red lines in order to secure any compromise. This could corner the PM and force her to return from Brussels empty-handed." "Over the course of the next week or so, it should become clear whether there is a real chance that PM May stands a good chance of winning a compromise with the EU that will be sufficient for her to push her amended Withdrawal Agreement through parliament." "It is our central view that a soft Brexit is the most likely outcome and that EUR/GBP will settle in the 0.87-0.86 area in the months ahead. However, GBP is vulnerable to bad news and on a no deal Brexit we would expect EUR/GBP to surge towards parity." "GBP/USD should fall further if EU officials keep their word and reject any changes to the Withdrawal Agreement’s Irish backstop, as we expect. Indeed it is difficult to reconcile what MP’s actually voted for last night. On the one hand they supported a non‑binding amendment to avert a ‘no‑deal’ scenario. Yet on the other hand, they supported a version of Brexit seemingly impossible to achieve (i.e. the PM’s ‘Plan B’ now including ‘alternative’ Irish backstop measures) pushing the UK closer to a default ‘no‑deal’. PM May now has until 13 February to negotiate with the EU and then deliver a new deal to the UK parliament." "The GBP call is a call on Brexit and we remain optimistic, despite risks. For now, what matters is whether the UK canavoid crashing out of the EU without a deal after March. If the Eurozone is not giving up on the Northern Ireland border backstop and the UK Parliament does not allow a no-deal Brexit, then the most likely scenario, in our view, is an extension of Article 50." "Kicking the can down the road should be enough to strengthen GBP, at least in the short term. The extension is unlikely to be long, but it will avoid the worst for now and could send a signal that no matter what the UK would not exit the EU without a deal. Markets may also start pricing a soft Brexit, with Norway+customs union the most positive for GBP. GBP remains substantially undervalued. We like GBP against both USD and EUR." "We don't think now is the time to buy sterling. Hedging GBP risk is still preferable. Brexit uncertainty remains the key downside risk to GBP-USD over the next three months." "As for EUR-GBP, as long as Brexit uncertainty is not resolved, UBS Global Wealth Management expects EUR-GBP to stay in a range around 0.90. A cliff-edge Brexit remains a key upside risk. If a Brexit transition deal is passed, EUR-GBP should drop to 0.86 on the back of the Bank of England resuming rate hikes in 2019." "The risks of a no deal Brexit are falling, but it is still entirely possible. Moreover, the likelihood of other outcomes – including a general election, second referendum, or even no Brexit at all – is rising." "UK markets have been taking their lead from the global news flow of late, as investors seem to be taking the view that Brexit will reach a pragmatic conclusion. But domestic assets will continue to be vulnerable to Brexit developments as they unfold, so volatility is likely to persist until a conclusion is reached."